Why was Donna killed off on Kevin Can Wait? 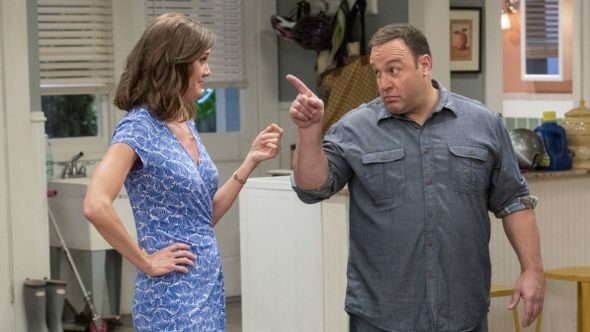 Recently, Kevin James spoke with the NY Daily News about Erinn Hayes’ departure from the CBS TV show, TVLine reports. As reported earlier, Hayes’ character Donna was killed off the comedy after only one season. The character was replaced by Leah Remini in season two, which premiere last month. The cast also includes Mary-Charles Jones, James DiGiacomo, Taylor Spreitler, Ryan Cartwright, Leonard Earl Howze, Gary Valentine, and Lenny Venito. Later, James revealed replacing Hayes with Remini was a no-brainer for the CBS sitcom. What do you think? Do you watch Kevin Can Wait? Do you think it was right to kill off Donna? Shouldn’t have killed off Erin Hayes. We stopped watching. I liked the chemistry of the family, friends and neighbors with her. We tried episode 1 of season 2 and it was horrible, just another episode of King of Queens. I think Kevin James has run out of steam. Stopped watching show when he fired Erin Hayes. He basically ruined the show. His lame lies do not work either running out of ideas! He was trying to get rid of Erin and bring in plastic face. The show was enjoyable season 1 with the wonderful family dynamic and his funny times with the friends. They might as well cancel this horrible show now. Will continue not to watch this crap. The relationship between Donna & Kevin was enjoyable to watch. Surely there would have been a way to bring in Remini without killing off a primary character. If there was a dearth of ideas, why not replace a writer instead? I’m disappointed that Kevin James threw a fellow actor under the bus in an effort to save his failing show. Will not be watching anymore. Trying to imagine shopping a pilot to a Network and telling them: “The premise is really fantastic and we think this show could go 20 or more episodes before we run out of ideas” Really Kevin??? And Les Moonves missed that? I like that Kevin and Leah are back together again. I think the show is great. Don’t miss the wife at all. I don’t think killing off the wife is a solution to “running out of ideas.” This is basically just King of Queens 2.0. Doesn’t matter to me, I am no longer watching. If JamesWas a good actor, it would work! But the problem is he doesn’t have it and you gonna build a show around The no talent! He kidnapped her self out of a simple seen. And there you have the basic problem what is wrong With the sho! No wonder running out of ideas! I was begining to really like the character of Donna, it was begining to come together with Kevin and Donna. Now with Leah Rhemini on the show it seems forced between Kevin and Leah Rhemini’s character. I don’t see the same on screen smoothness that they once had on King of Queens. My wife and I decided not to watch the show anymore, it just doesn’t seem too funny anymore. Oh and Kevin’s buddies are hardly even on anymore!! They are trying too hard to push Kevin’s and Leah’s characters to mesh together and it’s not working!! So CBS and the show runners created a property that had such a poor premise they “were running out of ideas in season 1”. Frankly, I think the ideas for season 2 are below the standard set in season 1. Show is pretty much off my viewing list. Completely ruined the show. You don’t kill your wife to go back to your high school girlfriend.